The thorax of insects carries the appendages needed for movement—the legs and the wings. The legs are covered by exoskeleton and are subdivided into several sections. The six legs are divided into 3 matching pairs. The legs of each pair are attached on opposite sides of the thorax. The wings are often clear with veins that divide them into sections. The placement of the veins and the shape of these sections are often used by taxonomists to identify the types of insects. The wasp below in Figure 8.4 has only one pair of wings which is a characteristic of wasps and bees. Other insects may have two pair. The legs and wings are moved by muscles that attach to the exoskeleton on the inside of the body and the legs. Most insects have powers of flight that are better than all other flying animals. They can steer very well, change path quickly, and go backward and sideways. Only the hummingbirds come close to matching the insects in flight. 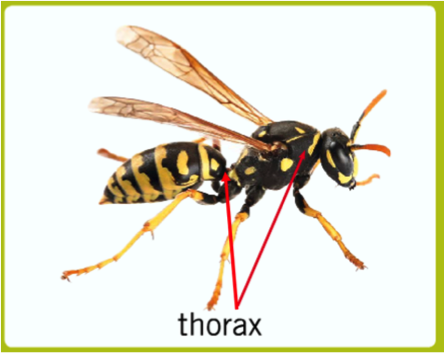 Figure 8.4: The thorax with its attached wings and legs, as clearly separated from the abdomen, is readily visible in this illustration of a wasp. The small size of insects and the fast beating of their wings made it nearly impossible for scientists to observe the mechanics of flight until recently. The invention of high-speed film allowed scientists to record insects in flight and watch their movements at super slow speeds. Some insects fly through a direct action of a muscle on each wing. One set of flight muscles attaches just inside the base of the wing, and the other set attaches slightly outside the wing base. The two sets of flight muscles work together, alternating contractions to move the wings up and down. In most insects, flying is a little more complex. Instead of moving the wings directly, the flight muscles change the shape of the thorax causing the wings to move. The muscles are attached to the inside of the exoskeleton of the thorax. When muscles attached to the top and bottom of the thorax contract, they pull down on the exoskeleton which causes the base of the wing to move down and the wings, in turn, lift up. Then another set of muscles, which runs horizontally from the front to the back of the thorax, contract. The thorax again changes shape, the exoskeleton at the top rises, and the wings are drawn down. Figure 8.5: Indirect flight muscles of insects. The top panel shows the contraction of the muscles attached to the top and bottom of the thorax with wings pulled up. 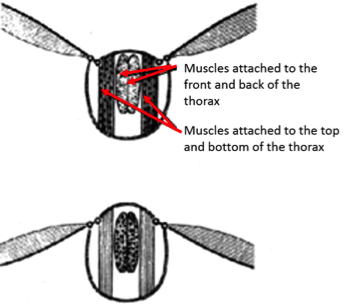 The bottom panel shows the contraction of the muscles attached to the front and back of the thorax with wings pulled down. During the flight of most insects the front and rear wings are locked together and move up and down at the same time. In some insect groups, most notably dragonflies, the wings move independently during flight. As the front wing lifts, the back one lowers. In addition, flight requires more than a simple up and down motion of the wings—they move forward and backward and can rotate. These movements allow insects to perform acrobatic maneuvers.